"Colors which you can hear with ears; Sounds to see with eyes; The void you touch with your elbows; The taste of space on your tongue; The fragrance of dimensions; The juice of stone. " 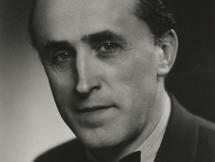 Marcel Lajos Breuer, known as Lajkó (May 21, 1902 – July 1, 1981) studied and taught at the Bauhaus in the 1920s, stressing the combination of art and technology, and eventually became the head of the school's cabinet-making shop. He later practiced in Berlin, designing houses and commercial spaces, as well as a number of tubular metal furniture pieces, replicas of which are still in production today. Perhaps the most widely-recognized of Breuer's early designs was the first bent tubular steel chair, later known as the Wassily Chair, designed in 1925 and was inspired, in part, by the curved tubular steel handlebars on Breuer's Adler bicycle. Despite the widespread popular belief that the chair was designed for painter Wassily Kandinsky, Breuer's colleague on the Bauhaus faculty, it was not; Kandinsky admired Breuer's finished chair design, and only then did Breuer make an additional copy for Kandinsky's use in his home. When the chair was re-released in the 1960s, it was designated "Wassily" by its Italian manufacturer, who had learned that Kandinsky had been the recipient of one of the earliest post-prototype units. company; one of the earliest introducers of modern design to the United Kingdom. Breuer designed his Long Chair as well as experimenting with bent and formed plywood. Breuer eventually ended up in the United States. He taught at Harvard's architecture school, working with students such as Philip Johnson and Paul Rudolph who later became well-known U.S. architects. (At one point Johnson called Breuer "a peasant mannerist". 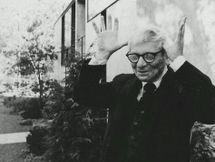 At the same time, Breuer worked with old friend and Bauhaus colleague Walter Gropius, also at Harvard, on the design of several houses in the Boston area. Breuer dissolved his partnership with Gropius in May 1941 and established his own firm in New York. 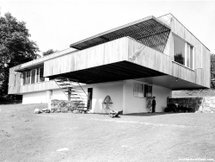 The Geller House I of 1945 is the first to employ Breuer's concept of the 'binuclear' house, with separate wings for the bedrooms and for the living/dining/kitchen area, separated by an entry hall, and with the distinctive 'butterfly' roof (two opposing roof surfaces sloping towards the middle, centrally drained) that became part of the popular modernist style vocabulary. A demonstration house set up in the MOMA garden in 1949 caused a new flurry of interest in the architect's work, and an appreciation written by Peter Blake. When the show was over, the "House in the Garden" was dismantled and barged up the Hudson River for reassembly on the Rockefeller property in Pocantico Hills near Sleepy Hollow. with an increasingly curvy, sculptural, personal idiom. Windows were often set in soft, pillowy depressions rather than sharp, angular recesses. Many architects remarked at his ability to make concrete appear "soft". Between 1963 and 1964, Breuer began work on what is perhaps his best-known project, the Whitney Museum of American Art, in New York City. He also established a Parisian office with the name "Marcel Breuer Architecte," from which he could better orchestrate his European projects. Also during this time, Herbert Beckhard, Murray Emslie, Hamilton Smith, and Robert F. Gatje became partners in Marcel Breuer and Associates. When Murray Emslie left a year later, he was replaced by Tician Papachristou, who had been recommended by Breuer's former student, I. M. Pei. Breuer is sometimes incorrectly credited, or blamed, for the former Pan Am Building (now the MetLife Building), an unpopular high-rise in New York City. The Pan Am was actually designed by Emery Roth & Sons with the assistance of Walter Gropius and Pietro Belluschi. Breuer's name was associated with the site because in 1969 Breuer developed a 30-story proposed skyscraper over Grand Central Terminal, called "Grand Central Tower", which Ada Louise Huxtable called "a gargantuan tower of aggressive vulgarity," and became a cause celebre. Breuer's reputation was damaged, but the legal fall out improved the climate for landmark building preservation in New York City and across the United States.